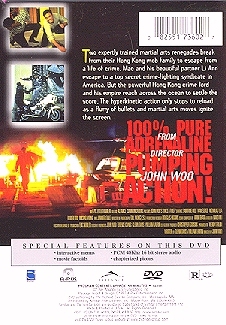 The back of the DVD case. The front is nearly identical to the front of the videotape sleeve. The spine repeats the photos of Victor and Li Ann from the front picture. 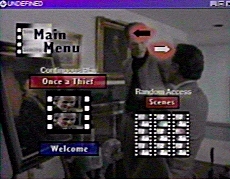 The opening menu of the DVD. You have a choice of watching the movie continuously, or choosing "Random Access." The main menu shows the various "chapters" you can start viewing the movie from, and offers a "Film Facts" choice as well. "Film Facts" is disappointing. It just lists the year the movie was made, who directed it, the actors, the running time, etc. Nicholas Lea isn't even mentioned, and Sandrine Holt's name is misspelled as Sardine Holt! All in all, this DVD is not very impressive. It looks like a rush job. There are errors in the text of the menus. The title of the movie isn't even listed at the top of the viewing window. The quality of the picture and sound is spectacular, as expected, but is marred by frequent digital artifacts. Some DVDs offer versions or subtitles in different languages, behind-the-scenes or previously unseen material, or the option of viewing certain scenes from different camera angles. The ONCE A THIEF DVD offers none of these. According to the credits, the DVD authoring is by The Richard Diercks Company, Inc.; based on this example, I wouldn't buy another DVD by them. However, the price is pretty low - at $11, it's a few bucks cheaper than the videotape.